There’s just one thing wrong with this picture book. There wasn’t another in the series to go out and buy as soon as I got to the end. 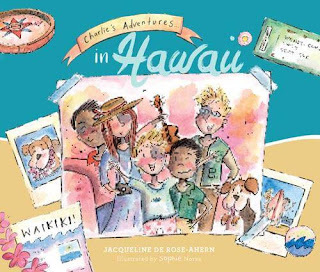 Seriously, I was bowled over by the heart-warming charm of this touching story and its lively illustrations—which include a map in a pocket on the inside back cover. Being ‘wowed’ by a travel adventure is not something I expected to happen when I first dipped inside its covers. Maybe it was the word game that was the drawcard. I’m always a sucker for a story that involves wordplay and this one involves a bit of detective work as well! There’s an aspect of a treasure hunt to the story. As Charlie goes to different parts of the island, he’s taught about significant Hawaiian words. Words like ‘unity’, ‘humility’, ‘kindness’. Once put together, their first letters spell out ‘Aloha’ and his adventure becomes one of learning what makes up the Aloha spirit. Although the target audience is suggested to be 3–6 years, I suspect the concepts might be better directed to an age group just a tad older, maybe 4–7 years.